One Painting Can be Licensed for Multiple Products - Right? The statement "The beauty of licensing art is that one painting can be licensed many times creating multiple avenues of revenue." is often used when describing the benefits of licensing art. Well in theory that is correct. But it really depends upon the art style, color pallet, what the painting depicts (theme), and how the art is formated. Each manufacturer has different art needs and a painting may not match all their requirements. Thus, every painting an artist creates may NOT be suitable for licensing or even suitable for licensing on multiple products. For instance, manufacturers in the greeting card industry usually want art that expresses an emotional me-to-you response in the consumer. The decorative flag industry wants art that is vertically formatted and highly saturated in color. The jig-saw puzzle industry wants art the does not have a lot of "white-space." The home décor industry normally wants art that have muted unsaturated colors while other industries want saturated colors. Although, art with unsaturated colors may be acceptable for most industries if the theme and art style fit niche markets such as lodge. Read the following articles for more information about art requirements for some industries. "Licensing Art to the Greeting Card Industry"
"Licensing Art to the Flag Industry"
"Licensing Art to the Jigsaw Puzzle Industry"
"Licensing Designs to the Quilt & Craft Fabric Industries"
Christmas themed art is used by most industries but other themes may not work for all of them. For instance, birthday themes are important for the paper product industry (greeting cards, gift bags, wraps, and party goods) but not for home décor, tabletop, or linens. Paintings of landmarks, buildings and scenery work well for art prints and jig-saw puzzles. But those themes do not sell well in other industries unless the products are created especially for niche stores such as museums and specialty gift shops, or painted by well known artists like Thomas Kinkade. So if artists want to maximize the possibility of licensing their art and licensing the art on multiple products, they should make sure that they create art that meets the requirements of as many industries as possible. That means learning what manufacturers want and creating art to fulfill them. Artist Jane Mayday emphasizes this concept in her blog article "Getting Started in Art Licensing." Artists also need to create art so that it can be reformatted in multiply ways so that it can fit on different product shapes. Reformatting can be accomplished as Jane Mayday demonstrates in her blog article "Spring Has Sprung" by planning art elements before doing the actual painting and then performing minimal Photoshop manipulations after scanning the art. It can also can be done by painting icons and backgrounds, scanning them, and manipulating everything in Photoshop, or lastly creating the art on the computer and manipulating it all in Photoshop. Comments and suggestions about this article are greatly appreciated. Click on the comment section below to enter your comments. Because I write blog articles about using Photoshop for art licensing, I often get queries from artists on how to solve art problems in Photoshop. In many cases, I have no clue but I do love the challenge in finding out so that I can learn new Photoshop techniques and then share them with you. This article is in response to artist Patti Gay's questions on how to adjust and correct her scanned art in Photoshop. When art is scanned for use in Photoshop, there are often several challenges that artists have to contend with. First, artists may want to remove images from the original background to be used with new backgrounds, in new paintings, or for use in patterns or borders. Second, sometimes moiré patterns (irregular wavy lines) occur in the scanned image which needs to be removed. And the third challenge is aligning and melding several images together if the art is larger than the scanner window. Photoshop has some amazing tools and techniques and below are links to videos showing how some very talented Photoshop experts solved these problems. Read the article "Photoshop Tip: Four Methods to Extract Images/Icons from Scanned Art" for techniques on removing icons and images from scanned art. Photoshop CS5 (expected to be released mid May) will have another method with their new spot healing and fill tool. The video by Russell Brown called "Make Moiré Go Away" shows two methods in removing moiré patterns. 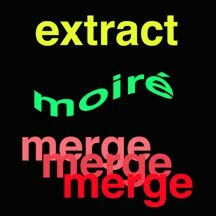 Merging several paintings together is possible with Photoshops auto align command. For those of you that have Photoshop CS3 view "Photoshop CS3 Beta- Auto Align Layers" video. Photoshop CS4 has an align version that has more options and is much more powerful. View the video "Adobe Photoshop CS4 Chapter 1/13 The New Auto Blend & Auto Align Layer Command." If you have comments and suggestions on more ways in "tweaking" scanned images, please enter them in the comment section below. Adobe Creative Suite 5 Announced: Includes New Photoshop Effects & Tools! Today Adobe announced their soon to be published (mid May) Adobe Creative Suite 5. And wow! there are some new effects and tools in Photoshop that will knock your socks-off. 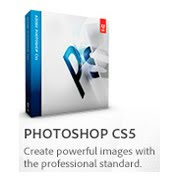 I'm sure that the other software in the suite also have some great improvements but this blog article only discusses Photoshop CS5. Photoshop CS5 has faster performance across platforms, efficient workflow, better media management and superior HDR imaging. Added are new painting brushes and effects, ability to remove images faster and better from backgrounds, ability to do a better job of selecting intricate image elements such as hair, ability to create 3D text and artwork easily, and ability to do precise warping of images. Check out "What's new in Photoshop CS5 Extended" to view VERY short videos of these new effects and tools. The upgrade price depends on the software version you already own. Below are some of the new tools and effects in Photoshop CS5. I can see all sorts of uses with these in creating and improving art, photographs, and product mock-ups! A new painting mixer brush with numerous bristle tips that let you create lifelike, textured brush strokes have been added to the tool bar. View "Sneak peek of new Photoshop CS5 technologies" for a demonstration. You can easily remove any image detail and have the background filled as though the image never existed. Removing images in previous versions of Photoshop required a little work with the clone tool but this looks even faster and easier. Note: I'm really worried about how easy a person can remove copyright information from paintings with this tool. Check out "Adobe Photoshop CS5 - Spot Healing and Fill Tool" to see a demonstration. You can easily eliminate background color around images using masks with new refinement tools In CS5. This is suppose to be a better way to select details such as hair. View "Adobe Photoshop CS5 - Better edge detection and masking results in less time," demonstration 2, and demonstration 3 on how this effect can be used. This is a new tool with detailed mesh and the ability to add and remove control points to precisely warp and stretch images. This is a huge improvement of the warp tool in earlier versions of Photoshop. View "Sneak peek of new Photoshop CS5 technologies" for a demonstration. This new effect allows you to twist, rotate, extrude, bevel and inflate text and designs. This "may" work for creating some product mock-ups (dishes, etc.) but needs to be tested before knowing for sure. View demonstration one and demonstration two to see some of its capabilities. Comments and suggestions about this article are greatly appreciated. Click on the comment section below. License Global magazine release their 2009 top licensors. As usual Disney and other character brands top the list but some artists are also included. Read "Top 125 Global Licensors" for details. Thomas Kinkade's art on products sold $400 million (M) at retail, Jim Shore $192M, and Paul Brent $67M. That is approximately the same or a little lower than last year. Read "Tracking The Success of Top Art Licensors" to see a tally sold in previous years. The amount sold at retail by other artists such as Susan Winget (represented by Courtney Davis) and Hautman Brothers (represented by MHS Licensing) were not listed individually this year but folded into their agents figures. Courtney Davis' artists art on products sold $215M at retail, MHS Licensing $88M, and Wild Wings $63M.